Most adults would prefer not to wear ugly metal braces just to straighten their teeth, but that doesn't stop them from wanting to have straight, perfect smiles. At La Jolla Dental Care, world-class Cosmetic Dentist Charles Briscoe offers three different ways in which you can achieve your goal of straight teeth without metal braces — including one adult orthodontics option that takes only 2 weeks! If you would like to move your teeth into a proper position, gradually improving your bite, Invisalign is a perfect solution. Dr. Briscoe will guide your Smile Makeover with a series of clear plastic aligners, changing about every two weeks, until your teeth are in the desired location. The aligners are removable and just about invisible — a convenient and popular option for our adult orthodontics clients looking for the finest results with Invisalign San Diego has available. If you would like to move your teeth more quickly, and the focus of your change is on the front teeth that most impact your smile, Six Month Smiles may be the solution for you. With clear brackets and tooth-colored wires, these fast-acting braces are very discreet and can work wonders. 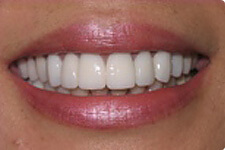 Dr. Briscoe's patients often say he offers the most beautiful results with Six Month Smiles in San Diego. If you are in a hurry, and want to have your teeth straightened without the hassle, Instant Orthodontics, featuring porcelain veneers, may be the right answer for you. After all, you've waited long enough for those straight teeth, haven't you? In a Consultation, Dr. Briscoe will help you decide how best to improve your smile. The best way to find out which solution for straightening your teeth will work best for you is to schedule an adult orthodontics consultation with top San Diego dentist, Dr. Briscoe. In a consultation at his La Jolla office, you can ask all of your questions, and find out exactly how each solution would work for you.